Rent a Quinceanera Party Bus today! Party Bus SF is excited to offer fun, stylish and affordable Quinceanera party bus services for your upcoming quinceanera. We know how important this day is for your daughter as it represents her blossoming from a girl into a young woman. We have many different party buses to choose from-- from 20, 30 and 30+ passenger buses to accommodate everybody in your party. 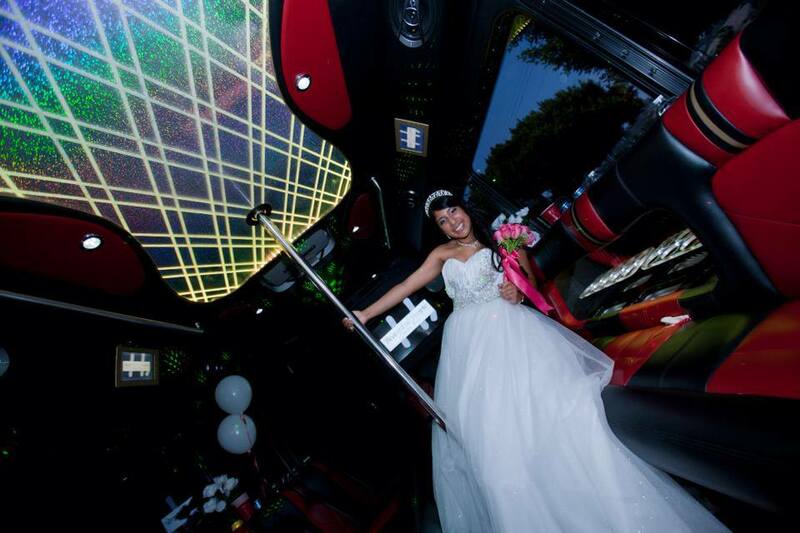 Our party buses also come equipped with the best amenities for ultimate fun during your quinceanera. Enjoy features such as our leather seating all around the sides, flat screen TV, DVD and CD players, iPod hookup for music, nice sound system, fiber optic lighting, non-alcoholic refreshment bar stocked with ice and cool beverages. Our professional drivers will take you to all your specific destinations, such as church, the park for photos, and your reception hall. Your daughter will be treated like the princess of the day with special VIP service from our chauffeurs and arrive to each destination on time and in style. When you call, you will speak to one of our very helpful staff member who go over the different limousines available and help find the one best suited for the number of passengers in your party and, of course, your budget. Don't forget to take photos inside and outside our luxury party buses so that she can remember this day for all times. She will be so ever grateful for all that you have done. We are ready to take your call and answer any questions you may have about our rates, service, and party buses. We look forward to providing you with the best Quinceanera party bus in San Francisco.